By learning how to use human-centred design, your team will work together better and improve how you navigate complex challenges. Our courses will push your team to think a little differently and apply a creative lens to problem-solving. Overlap provides in-depth learning opportunities for a variety of topics related to human-centred design. These range from creative problem solving and working collaboratively to leading transformative meetings. Our workshops are fun and engaging while enabling participants to develop an understanding of human-centred design (and how to apply it to your organization’s toughest problems). Participants also gain access to a suite of simple yet powerful tools that can be applied immediately. We have a variety of course formats to suit different learning objectives and experience levels. At Overlap, human-centred design is how we put creativity and empathy to work to help us solve problems. That’s why we created our Master Class in Human-Centred Design Series. These full-day workshops pair human-centred design with some of our other methods to help course participants build confidence in their design practice. The Master Class Series is great for teams looking to learn how to become human-centred design practitioners within their organization. Do you find some meetings feel unproductive? Are you struggling with generating new ideas? In this full-day workshop, we’ll begin with an overview of human-centred design: what it is, how it works, and what the go-to methods are. We’ll then spend the afternoon learning the concepts and practicing the skills needed for the production of new and useful ideas. Have you ever been in a meeting where you only hear from the same few people? What about a meeting that gets off track? In this full-day workshop, we’ll begin by learning about human-centred design. Then we’ll switch gears and learn about facilitation. Using the ORID framework, a method for facilitating focused conversations, you'll help meeting attendees reflect on what they've discussed and learned. This will result in better alignment and understanding. Is it difficult for your teammates to reach an agreement on something? Are too many opinions and ideas affecting your ability to make decisions? In this full-day workshop, we’ll learn about human-centred design. We’ll then extend the practice with Overlap’s favourite technique for surfacing, combining, improving, and prioritizing the best insights a group has to offer using a Card Workshop. The Card Workshop is a wonderful way to ensure all voices in the room are heard. It’s also a great way for people with opposing views to reach consensus. We believe there’s no one-size-fits-all approach to training, which is why we recommend working with us to build a custom training program for your team. It could be a couple of hours, a half-day, or full-day of training depending on your team’s needs and goals. Below are a few different options for you to consider. You can select one of our full-day offerings (like one of the options from our Master Class in Human-Centred Design Series) or mix it up with a couple of half-days or a 90-minute crash course paired with an afternoon facilitation. Choose from any of the courses below when planning your day. See a few courses that pique your interest? Be sure to mention these to our Business Development team as you customize your training program. So, you’ve heard of human-centred design, but are curious about how it works. In this 90-minute course, we introduce participants to ideas and tools essential to the design process. Learn about the design cycle and why it's important to be flexible and collaborative in problem-solving. This course is for people who want to explore what human-centred design is about. Learn about the needs of your stakeholders by asking great questions. This workshop will give you the tools to form questions that uncover new insights by reducing the effects of bias, priming, and assumptions. Your ability to develop questions that drive to the root of a problem will help you get deeper feedback. Learn how to collect and act on feedback to ensure that your solutions will actually work. This course will give you what you need to run a feedback workshop using simple tools and facilitation techniques. Learn how to run sessions for small or large groups and what to do with the feedback you gather. Learn how to approach a tough problem in new ways. This workshop will teach you how to work through a complex problem using three practical tools as the building blocks. The techniques taught in this workshop will give you the confidence to move stakeholders and colleagues through a structured approach to solving your toughest problems. Before jumping to solutions, learn how to clearly identify and unpack a problem. We all know what it feels like to face a problem that doesn't seem solvable. This workshop will help you learn how to define and break down a problem to find possible solutions. Draw it out! Learn how to build a vocabulary using visual expression to improve how your team communicates with each other. The simple techniques introduced in this workshop will help your team break down complex ideas and highlight new and interesting connections. No visual art experience required. Looking to learn more about human-centred design? Interested in discovering how to apply design thinking to your toughest problems? This half-day workshop will begin with the basics of human-centred design. From there, you'll apply the information you've learned to a hands-on exercise. This course is for people who want to learn the basics of human-centred design and how to apply it to their work. Learn how to manage and close meetings in an effective and meaningful way. 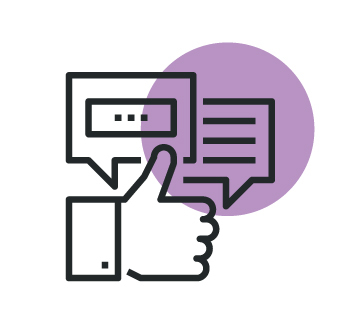 Using the ORID framework, a method for facilitating focused conversations, you'll help meeting attendees reflect on what they've discussed and learned. This will result in better alignment and understanding. Designed for people who want to increase their competence in presentation and facilitation. Learn how to facilitate Card Workshops. What's a Card Workshop? A Card Workshop is a technique used for planning, aligning teams, and achieving buy-in. Overlap uses Card Workshops during activities such as strategic planning, community engagement, and creative collaboration. Designed for people who want to increase their competence in facilitation and collaboration. By seeking feedback from real people, we learn about the needs of the people at the heart of the problem we are working on. Community engagement is an integral part of human-centred problem-solving. This workshop will introduce your team to useful community engagement tools and processes. It will help your team make better decisions and prioritize your work based on what you learn from your community. Agile is an iterative and visual approach to project management. Originally developed in the tech industry, the Agile method allows teams to respond to projects in segments. This course will introduce you to the Agile approach—planning the work, doing the work, and learning from the work—to help your team better respond to change. Interested in learning more about our group training options? Connect with someone from our Business Development team today. Discover how you can train like an Overlapper through our open-enrolment courses at our studio. Visit our Group Training Course Policies page to learn more about course registration, cancellation, and other things. Fill in the form below to receive updates to course offerings and other news from Overlap.